2017 has been an absolutely insane year for crypto. For traders, it’s been packed with an endless myriad of opportunities and little time to properly evaluate even a fraction of them. Owing to the extreme bull market, virtually every medium-to long-term strategy executed with some determination has been ridiculously successful, regardless if it involved holding only bitcoin, going all in on bitcoin cash, investing in a large variety of altcoins or betting big on every popular ICO under the sun. As the Christmas holiday approaches, now is an excellent time for traders to take a step back, re-evaluate current portfolio distributions and position oneself for the year to come. In this post, we’ll evaluate the current crypto landscape and see if we can make some educated guesses as to where the money will flow. It’s likely that 2018 will be remembered as the year after public interest for bitcoin boomed, but the year before the chosen path of scaling approaches (Segwit, Schnorr, MAST, Lightning Network) really came into effect. This sets the scene for yet another year of infected conflict, which, for the trader, just means more trading opportunities are on the horizon. While some parts of the community are certainly satisfied with bitcoin as a form of digital gold, the divide between the SoV (store-of-value) and MoE (medium-of-exchange) proponents is likely to increase further as hefty fees become an inescapable part of the reality of bitcoin. While the failure of Segwit2x may have been seen as a testament to the resilience of bitcoin by many, the technical grounds on which it was rejected indicates that no hard-fork block size increase without replay protection is likely to be successful. The political grounds on which Segwit2x was rejected also means that it’s going to be very difficult for a group of companies to agree on naming a hard-forked version of bitcoin “bitcoin” on beforehand. In effect, it is unlikely that a block size increase hard-fork can be launched as anything other than an altcoin. As such, it is entirely possible that the bitcoin community leaves walk-over of the MoE share of the cryptocurrency market during 2018 to some altcoin, while it focuses on bringing second-layer solutions to life. Here are a few examples of potential 2018 MoE contenders. Case: While Bitcoin Cash certainly has the block size properties to handle the MoE market, its real strength sits with the strong on-chain scaling convictions of its community. Communities are the cornerstones to the success of any cryptocurrency; they comprise the market demand that cause services to support them, and are the ones that provide value and security to a coin. The strength of the community, combined with the inherited codebase and coin distribution from bitcoin (BTC), makes bitcoin cash a strong contender for capturing the MoE market during 2018. 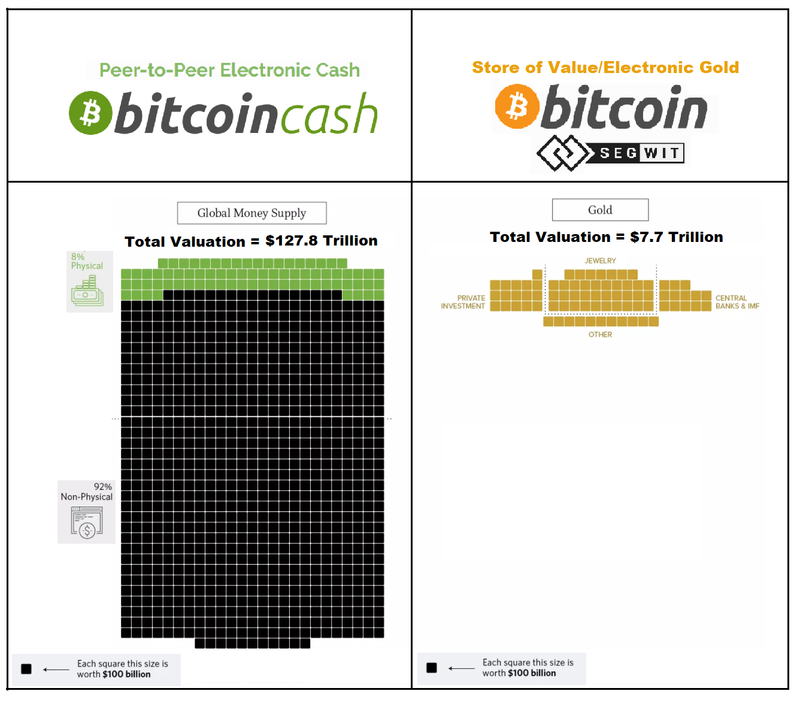 Recommendation: Hold as many bitcoin cash as BTC. Case: Litecoin (LTC) is basically bitcoin with 4 times the block rate and 4 times the supply. While it doesn’t share coin distribution with bitcoin, it does have a long track record, a popular main figure, and it comfortably sits outside the infected conflicts surrounding bitcoin. The implementation of SegWit allows it to benefit from the Lightning Network when ready, which means that Litecoin can manage similar high on-chain throughput during 2018 to Bitcoin Cash, while simultaneously benefiting from the advanced scaling approaches of bitcoin in the future. Recommendation: Hold 4 times as many LTC as BTC. Case: While Ethereum doesn’t have a block size limit, it does have a block gas limit which is set dynamically by miners for every block. Currently, the Ethereum network is processing north of 800,000 transactions per day, with a median transaction fee of just 60 cents. In contrast, bitcoin processes roughly 350,000 transactions per day where $10+ is currently needed to get into a block in a timely fashion. At the same time, this doesn’t mean that Ethereum (or Litecoin or Bitcoin Cash for that matter) scales better than bitcoin. In fact, it scales worse than bitcoin, except that the cost of processing transactions is absorbed by the nodes instead of the users. The Ethereum community knows this, and know that they must also develop new techniques in order to scale for MoE, which they’re currently pursuing through sharding and Raiden. Until such protocols are in place, Ethereum is unlikely to compete for the MoE market. Recommendation: No reallocation for MoE necessary. Case: While it’s currently not looking very promising for bitcoin to be able to support the MoE market of 2018, there are a few things which could change in favor for bitcoin during 2018. Let’s first remember that only a few weeks back, 25 cent fee transactions cleared from the mempool. The current high fees are likely an effect of a mainstream craze and speculation in bitcoin which won’t necessarily be as intense throughout all of 2018. Fees could very well go down on their own. Otherwise there’s also the possibility that some large businesses, such as blockchain.info and Coinbase, adopt Segwit and that Coinbase starts batching transactions, which would reduce mempool load significantly. If none of that were to happen, there’s still a slim possibility that the community in bitcoin reaches consensus on a new soft-or-hard fork block size increase proposal. Recommendation: Don’t sell all your bitcoins. What do you think is in store for 2018? Let us know in the comments section below.